I want to thank the nn-Café patrons who gave me encouragement during my last week of work on this. As I remarked back then, some aspects of writing a book — even a short one — require a lot of persistence. But I also want to take this opportunity to make a suggestion. There are now quite a lot of introductions to category theory available, of various lengths, at various levels, and in various styles. I don’t kid myself that mine is particularly special: it’s just what came out of my individual circumstances, as a result of the courses I’d taught. I think the world has plenty of introductions to category theory now. What would be really good is for there to be a nice second book on category theory. Now, there are already some resources for advanced categorical topics: for instance, in my book, I cite both the nnLab and Borceux’s three-volume Handbook of Categorical Algebra for this. But useful as those are, what we’re missing is a shortish book that picks up where Categories for the Working Mathematician leaves off. Let me be more specific. One of the virtues of Categories for the Working Mathematician (apart from being astoundingly well-written) is that it’s selective. Mac Lane covers a lot in just 262 pages, and he does so by repeatedly making bold choices about what to exclude. For instance, he implicitly proves that for any finitary algebraic theory, the category of algebras has all colimits — but he does so simply by proving it for groups, rather than explicitly addressing the general case. (After all, anyone who knows what a finitary algebraic theory is could easily generalize the proof.) He also writes briskly: few words are wasted. Ends and Kan extensions (already in Mac Lane’s book, but maybe worth another pass). Someone else should definitely write such a book. 2-limits, pseudolimits, lax limits, bilimits, etc. But perhaps the above is also too ambitious. I agree, many of the chapter headings could be a book by themselves. Some of them could be several books by themselves. But that’s what I meant about being selective. You set yourself a limit of, say, 20 pages per chapter. Then for each topic, you simply choose the most important aspects to cover in those 20 pages. If the material is consistently well-chosen, then the book could be really useful. That’s not to deny the potential usefulness of the kind of single-topic book you’re describing — it’s just a different kind of book with a different aim. For instance, my Informal introduction to topos theory might be an OK choice of material for the topos theory chapter, although it’s not at all written in the style I’m envisaging. Kelly and Street’s Review of the elements of 2-categories could have been a good choice of material for the 2-categories chapter, if the book was being written 40 years ago. Multi-sorted first-order logic and its associated (weak 22-)Categories: basically an amalgamation of roughly half of A1 and D1 of the Elephant. Limits, adjunctions, and (commutative) monads in (strict) 22-Categories: basically a first introduction to Kan limits and Kan extensions; monadicity theorems; finitary (commutative) algebraic theories. Higher-order logic and the definition and properties of a weak topos; the definition of the category of Sets (most of A2 and pieces of D4 of the Elephant). Basics of enriched category theory: Yoneda lemma as enrichment in closed categories; enrichment in monoidal closed categories; the Yoneda structure on the 22-Category of Set-enriched categories. Simplicial sets, homotopy categories, the Dold-Kan correspondence for semi-abelian categories. Basics of algebraic topology from a categorical perspective. Basics of simplicial schemes and dg-algebraic geometry. That categorical concepts are never introduced for their own abstract sake, but only when they provide a simple and clarifying organizational principle. That no single “chapter” takes more than 10ish letter-sized pages with 1 inch margins. I am glad to hear that someone shares the same affliction! I have been writing some notes on homotopical algebra, but frustratingly it is neither deep nor concise. The “chapter” on simplicial sets alone is over a hundred pages already, as is the “chapter” on model categories. Are you referring to a defect in the category theory literature, or in the algebra / topology / geometry literature? That is, do you wish for something like “Algebraic geomtery for category theorists”, or “Category theory for algebraic geometers”, or something else still? Sorry to nitpick, but the bottom right corner of the last commuting square on page 96 in your sample section on the Yoneda lemma, is that meant to be two expressions stacked on top of each other? Is there meant to be an equals or isomorphism sign somewhere? Yup, that’s how it’s meant to be, nope, there’s nothing missing, and yup, it’s identical to the printed version. The book is printed directly from my PDF. Tom: Great to see it has escaped. I know the problem mentioned by others of writing things down in order to understand them. Have a look at my Menagerie… nearly 1000 pages. On the other hand any such document acts as a mine not only for ideas but for text. If you want to write a survey article, or a set of notes for a short minicourse of lectures, you have a mass of material available. Copy, paste, edit and the participants of the minicourse have their background reading on-line in a pdf file. ‘Edit’ in this case usually means add in examples and cut out `drivel’ that had seemed right to include for an earlier use! 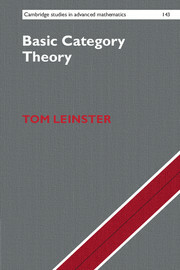 I like the idea of a “second course in category theory” book. Here’s a radical suggestion: what about writing it as a collaborative project? I think the HoTT book showed that it really isn’t as hard as you might think to write a book collaboratively. And I bet it would be a lot easier to recruit people to write a single chapter of such a book than to find someone willing to write the whole thing, and the end result would probably benefit from their different perspectives. Thanks. Actually, the collaborative approach was one that Nicola and I discussed. I think we spoke in terms of having five authors do two chapters each. But there are potential downsides; in my opinion, handbook-type multi-author affairs can be pretty patchy. (I’m not talking about the HoTT book here.) My view was that there needs to be a dictator clearly and explicitly in charge, someone who’s uninhibited about imposing a uniform style and quality on the whole thing, someone who will edit the whole thing mercilessly. there needs to be a dictator clearly and explicitly in charge, someone who’s uninhibited about imposing a uniform style and quality on the whole thing, someone who will edit the whole thing mercilessly. I agree. There were a few of us who did essentially this for the HoTT book too; otherwise it would be a lot less readable. So that one person might have a somewhat bigger job, but still not nearly as big as writing the whole thing themselves, especially if they weren’t assigned any chapters of their own. The dictator’s job is also a lot easier if they don’t have to do it all after the fact: being strict from the get-go about defining and using semantic macros, for instance, simplifies life a lot. It’s an introductory category theory text, and I can prove it exists: there’s a copy right in front of me. You call that a proof? Then I can prove a measurable cardinal exists: I’ve got one right in front of me. But I’m willing to believe you! So congratulations! Steven Lack, A 2-categories companion. It’s informal and friendly yet packed with good information. I was never able to learn much out of Categories for the Working Mathematician, at least not until I already got the idea of a particular subject and wanted to know more theorems. I think of it as a reference, not a textbook. So I’ve always wanted more lively introductions to category theory. There need to be a bunch. At one point I might have written one with theoretical physicists as the intended audience, but now I can imagine writing a completely different one. I have been writing some notes on homotopical algebra, but frustratingly it is neither deep nor concise. The “chapter” on simplicial sets alone is over a hundred pages already, as is the “chapter” on model categories. “Deep and concise” is another way to say “hard to understand unless you already grok the material”. A long and clear explanation would help more people! Is there any possibility of category theory percolated down to high-school/college kids; after all group theory and vector-spaces made it. I couldn’t see the point of group theory then; at high-school I was more excited by physics; and the connection with physics wasn’t made, or even outlined; whereas vector spaces were immediately useful in condensing Newtonian Mechanics. Quite a few textbooks make the case that category theory can only be understood once one has digested quite a large fragment of mathematics. I’d be curious as to whether one could develop a useful course for bright high-school kids that lets them get something out of it. Schanuel & Lawvere tried it with Conceptual Mathematics; but they, as far as I recall, don’t make any connections to physics, or indeed to any other disciplines; it maybe that there are no useful connections to be made at that level. Maybe David Spivak’s book? I don’t think its target readership is high-school kids, but maybe it would serve the purpose. Incidentally, I hope it doesn’t seem as if my book “make[s] the case that category theory can only be understood once one has digested quite a large fragment of mathematics”. It does assume about what a pure-oriented student could be expected to have learned from an undergraduate degree at a British university, but only because that’s the level I was teaching at. No pronouncement is made on how much mathematical background is actually necessary in order for learning category to be a plausible ambition. Just to say that our library has a copy, which I’ve now borrowed in order to lend to my new PhD student.